When this card destroys a monster by battle and sends it to the Graveyard inflict damage to your opponent equal to the level of the destroyed monster x 200..
A high-performance unit developed to enhance the Artificial Intelligence program of the Allies of Justice. Loaded with elements collected from a meteor found in the Worm Nebula, it allows for highly t.. This card cannot be Special Summoned. During battle between an attacking "Ally of Justice" monster you control and a Defense Position monster whose DEF is lower than the ATK of the attacking monster i..
1 EARTH Tuner + 1 or more non-Tuner EARTH monsters. While this card is face-up on the field, you can send the top 2 cards of your Deck to the Graveyard to negate the activation of a Spell Card and des..
1 Tuner + 1 or more non-Tuner WATER monsters. Once per turn, you can return any number of face-up cards you control to the owner's hand. 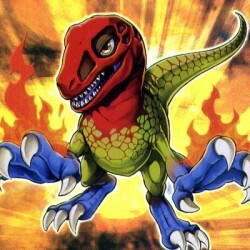 For each card returned to the owner's hand by this effect, this..
"Genex Controller" + 1 or more non-Tuner FIRE monsters. This card gains 200 ATK for each FIRE monster in your Graveyard, if this card destroys an opponent's monster by battle, inflict 200 damage to yo..